Handel's Agrippina (1709) is a wickedly entertaining opera filled with some of the most delightfully conniving and underhanded characters since Monteverdi's Coronation of Poppea (1642). 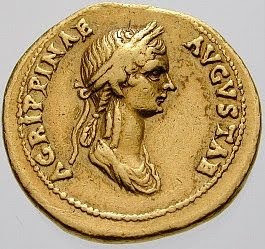 And that's no coincidence: Agrippina is a kind of prequel to the earlier opera and features many of the same morally suspect characters: the soon-to-be-emperor Nerone (Nero, here a petulant adolescent), the seductive Poppea, the wronged Ottone (Otho). Added into the mix are Nero's ruthlessly scheming mother Agrippina, who'll stop at nothing to see her son crowned emperor, the aged current emperor Claudio (Claudius), and two buffoonish freedmen, Pallante (Pallas) and Narciso (Narcissus), who do Agrippina's bidding in the hope of being rewarded with her love. In another parallel to the earlier opera, Agrippina has a similarly amused, skeptical tone. What's surprising is that this cynical and ironic (rather than morally disapproving) take on these backstabbing and corrupt characters was created by a cardinal, Vincenzo Grimani, who wrote the opera's libretto and probably commissioned the music from Handel. And of course Grimani could rely on his audience's knowledge of the characters and their tangled relationships. Historically, everyone who features in the opera came to a bad end: depending on which Roman historian you believe, Agrippina had Claudius and Narcissus murdered, while she herself was killed by Nero (as were Poppea and Pallas), and both Nero and Otho ultimately became emperors who were forced to abdicate by committing suicide. But ignoring the bloody reality, the opera's plot verges at times on bedroom farce, perhaps as Grimani's satire of the mores of the Papal Court. The action takes place a few years after the marriage of Agrippina and Claudio, and conflates and compresses historical events. As it opens, Claudio is reported lost at sea as he returns from the conquest of Britain (which occurred a decade earlier, but never mind). Agrippina and her co-conspirators Pallante and Narciso waste no time in declaring the teenaged Nerone to be emperor. To everyone's consternation, though, Ottone arrives and announces that he has rescued Claudio from drowning, and as a reward for saving the emperor's life he himself been named as the next emperor. He then unwisely confides in Agrippina that he cares more for the love of Poppea than for power. Agrippina, knowing that Claudio is also besotted with Poppea, then tells her falsely that Ottone has given her up to Claudio in exchange for the throne, and convinces her to get back at him by telling Claudio that Ottone wants her for himself. This leads to a brilliant scene halfway through the second act where Ottone, expecting to be crowned by Claudio, is instead denounced by him as a traitor. Ottone then appeals to Poppea, Agrippina and Nerone in turn for their intercession, only--to Ottone's shock and bewilderment--to be spurned by each of them. Another great sequence occurs in the third act, when Ottone, Claudio, and Nerone arrive in Poppea's bedroom in succession, and she has each one conceal himself to eavesdrop. She uses the situation to turn the tables on Agrippina and Nerone; it's like something out of a Rossini farce. Thanks to stolof for posting this live recording conducted by Fabio Biondi from the 300th anniversary production of the opera at Teatro La Fenice in Venice, the city where the opera had its 1709 premiere. The words are: "Pensieri, voi mi tormentate. / Ciel, soccorri a mie disegni, soccorri ciel! / Il mio figlio fa che regni / E voi Numi il secondate!" In English, "Thoughts, you torment me. / Heaven help me in my plan! / To bring my son to the throne. / Gods, help me!" Another remarkable thing about this aria is its structure. A typical da capo aria ends after its first section is repeated. However, Handel plays with those expectations: after the aria is apparently over, Agrippina has several lines of recitative and arioso, and then the A section returns again for a final time (the recitative begins at about 5:00, and the second repeat of the A section at 5:45). It's as though she can't help herself: she's obsessively returning to her plans and her hopes for their success. Even though Handel was only 24 when he wrote Agrippina, he was already subverting the conventions of opera seria to make his characters more psychologically rich. Performances and recordings of Agrippina are still comparatively rare, especially for such a musically brilliant, funny, and stylistically fresh work. 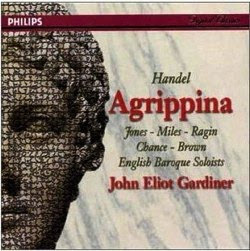 I first heard excerpts from Agrippina on Arias for Durastanti, with Lorraine Hunt (later Lieberson) performing what became for me definitive versions of "Ogni vento" and "Pensieri" (Nicholas McGegan conducting; Harmonia Mundi HMU 907056). I then turned to the full-length John Eliot Gardiner recording from 1991-1992 (originally released in 1997, and recently reissued; Philips 4380092). Although it has many excellent qualities, for some reason I've always found it vaguely dissatisfying. It features Della Jones as Agrippina, Alastair Miles as Claudio, Michael Chance as Ottone, Derek Lee Ragin as Nerone, and Donna Brown as Poppea. Perhaps it's because Jones' voice isn't as rich as Hunt's (when the oboe enters in "Pensieri," it sounds eerily as though Hunt is suddenly dueting with herself), or perhaps the fault is Jones' characterization--she simply doesn't convey the same strength and fierceness as Hunt (and what's Agrippina without a strong Agrippina?). Speaking of characters who lack power, Michael Chance's soft countertenor lacks the fullness that a female contralto would have brought to the role of Ottone (it was originally written for a woman, Francesca Vanini-Boschi). A pleasant surprise, though, is Alastair Miles' commanding bass as Claudio. Perhaps too commanding--after all, Claudio is supposed to be an enfeebled and besotted old man. 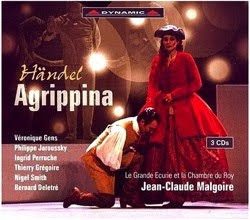 A countertenor Ottone (Thierry Grégoire, not a huge improvement over Chance) is also employed in the stage version of Agrippina from Théâtre Municipal, Tourcoing, France, conducted by Jean-Claude Malgoire and released on DVD in 2004 (Dynamic DVD 33431). My main problem with this version, though, isn't so much with the generally good cast, which includes the vocally alluring Véronique Gens as Agrippina and a young Philippe Jaroussky as Nerone. It's with Frédéric Fisbach's staging, which places many of the characters in unnaturally-colored fright wigs, offers a starkly minimal, unatmospheric set, and forces Gens to sing "Ogni vento" under a projection of something that looks like a child's drawing of a alien spaceship (you can see it here; any guesses as to what it might mean are welcome, because I find it utterly mystifying). As with Gardiner's recording, a highlight of this version is the performance of the Claudio, Nigel Smith, though again he seems a bit too youthful and vigorous for the role. If you're tempted by this one you might want to skip the images and just listen to it on CD (Dynamic 43113), though there the limitations of live sound are probably more apparent. Given the flaws of the Gardiner and Malgoire sets, I can only hope that conductors like Alan Curtis, Marc Minkowski, Christophe Rousset, or William Christie have this wonderful opera in their near-future recording plans.